If you want to capture competitive advantage, conventional wisdom advises that customer experience (CX) is key: there is a strong correlation between a positive customer experience and customer loyalty. Happy, loyal customers buy more. Equally important is that happy employees make for happy customers. So what's the problem? Many organizations still struggle when it comes to measuring the return on investment (ROI) on work to improve customer experience. Focusing on metrics - such as cross-sell, upsell, or cost of sale or campaign response rate — does very little to measure customer benefit. Some organizations begin by measuring customer satisfaction and churn. While that may be a good start, it provides little direct correlation to ROI. Measuring Net Promoter Score (NPS) is becoming increasingly popular. For example, the Temkin Group conducted research to measure the NPS of more than 340 companies based on a survey of 10,000 U.S. consumers. While NPS can provide insight (and a baseline) by itself, it is not sufficient to estimate the ROI on CX.It’s important to understand that customer experience revolves around the quality of all a customer’s encounters with a company’s products, services, and even the brand. That begins with the quality of the customer’s experience in accessing information on the Web, followed by the ordering experience, and includes the payment experience, the delivery experience, the warranty experience (if applicable) and the inquiry/complaints experience. 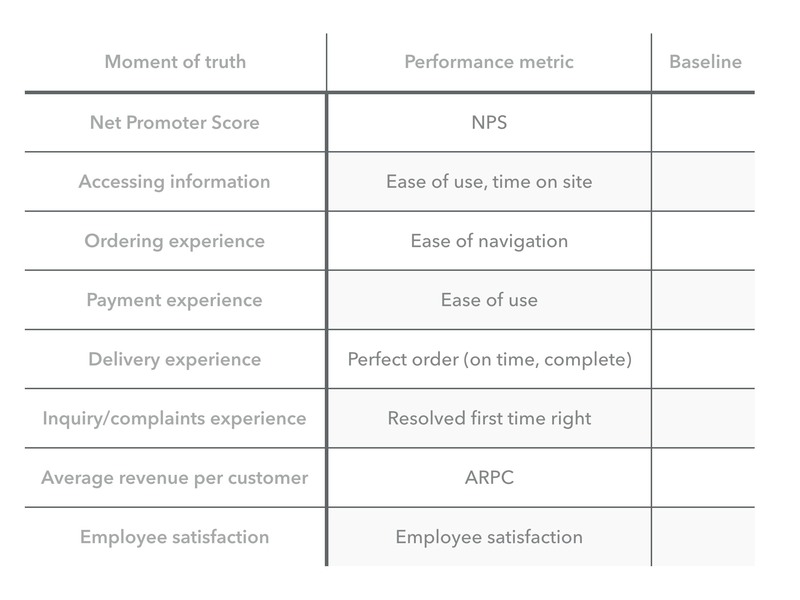 An effective effort at measuring the ROI on CX therefore has to encompass each of these key touchpoints or moments of truth. As with many measurement systems, it’s important to begin with a set of baseline metrics such as displayed in the table below. Option (c) is most likely to lead to success with digital business. Thoughtful executives understand the importance of paying attention to aligning people, processes, and culture to achieve long-term digital success. They focus on customer experience and ask how digital can make the customer journey easier and better. Then, they recognize that end to end business processes are what creates customer value. That’s why BPM maturity is so important for lasting digital business success. Researchers at the MIT Initiative on the Digital Economy have identified that leading companies use digital to transform both the customer experience and their operational processes while simultaneously challenging their business model. This is in plain contrast to other, less successful digital programs where companies take a technology led approach to solve discrete business problems of relatively small scope or when they attempt to deploy digital solely to resolve problems within departmental boundaries. It’s important to be aware of the central role of process thinking in developing business models and operating models. Andrew Campbell, a co-author of a book on the Operating Model Canvas, emphasizes that a one page operating model canvas promotes dialogue and is easy to share. To understand an operating model, it’s important to start with laying out the value chains or large processes that need to perform flawlessly to deliver the company’s value proposition. As depicted below, the operating model canvas can best be used when there is clarity on customer experience and the interdependence of the various components of the model. It’s fairly clear that the digital program has to be led from the top down. Employees want to work for leaders who get digital. Also, there is strong evidence to support that the integrated use of multiple digital technologies yields superior results to using one tool at a time in a disconnected fashion. Then, a focus on customer experience will help avoid sub-optimizing the benefits of digital technologies. While actions by individual departments can potentially improve customer experience, these benefits can be short lived unless changes are also made to supporting back-end systems or back office operations. Ideally, what’s needed is a management approach that emphasizes customer experience, features a business process based view of the enterprise and is integrative in nature. That’s why BPM maturity is so important. Indeed, BPM is unique in the sense that it combines a management discipline with enabling technology. Andrew Spanyi is recognized internationally as an expert in operational leadership and Business Process Management. He is the author of three books and has over two decades of management consulting practice experience. He has worked on over 170 major improvement projects and the development and delivery of dozens of sales and management training programs. He was an adjunct faculty member at Babson College in Wellesley, MA and currently acts as an Advisor to ABPMP and is instructor with BPMInstitute.org. Mobile phones have become an essential part of doing business today. Over eight out of ten U.S. small business owners use their mobile devices for business at least once a day, and over one in four use them once an hour, a Manta survey found. About three in four companies allow employees to bring their own mobile devices to work, Tech Pro research has found. While most companies are using smartphones for work, not all companies are making maximum use of the capability of mobile technology to improve their operational efficiency. Here are four ways you can use today’s technology to streamline your workflow. Bookkeeping is one of small business owners’ most dreaded tasks. Most small business owners waste over 41 hours a year on accounting and tax-related paperwork, equivalent to a full work week, a SCORE survey found. 40 percent spend over 80 hours a year. Not surprisingly, 40 percent also said bookkeeping was their least favorite part of running their business. Fortunately, today’s financial management apps let you use your smartphone to automate much of your bookkeeping. You can use a cloud-based accounting app such as QuickBooks Online to manage your business finances and update your books from anywhere. Integrate your accounting app with point-of-sale and e-commerce apps to automatically enter sales into your books and update your inventory. You can also automate tasks such as payroll management and expense reporting. For instance, you can use a smartphone with a high-quality built-in camera such as a Samsung Galaxy S7 to scan in expense reports so you don’t have to enter them manually. Mobile devices can also help you and your employees streamline your communications and meetings, two of the biggest time wasters for any business. Traditionally, companies have communicated with employees by email, which can be inefficient if you need to include multiple people in a conversation, reference previous comments from before one party joined the conversation or keep document versions in sync. To make communication more efficient, companies have turned to mobile tools such as Slack, which are designed like social media sites rather than email, enabling all parties in a conversation to see the same views and document versions. Digital tools can also help you make managing meetings easier. You can use digital calendar tools to schedule your meetings and send invitations. You can also hold meetings without leaving your office by using video conference tools. Microsoft’s Skype for Business supports video conference calls and integrates with Microsoft’s Office package so you can also schedule meetings using the same interface. Digital technology can also help streamline project management flow. Some communication tools such as Slack include features that let them double as project management apps for small business teams. For instance, Slack lets companies set up channels that can be dedicated to particular projects, with project-related documents accessible to participants in the channel discussion. Productivity suites such as Office 365 and Google Docs can also serve as project management tools. These suites come with built-in communications, calendar scheduling and document creation and sharing features, enabling them to be used as a central interface for project managers and team members. Technology tools can also help streamline your sales and customer service operations. Some cloud-based customer relationship management interfaces include features and options that enable them to serve as both sales and customer service tools. For instance, Salesforce is primarily a customer relationship management platform geared toward streamlining sales operations, but its CRM function can also be integrated with the Salesforce for Service app. Other apps are more specifically geared toward customer service. For example, Aspect offers cloud-based customer service tools that let representatives transfer customer service tickets from one agent to another or one channel to another. This avoids customers having to repeat the same information to multiple representatives, eliminating a major source of customer frustration and boosting customer satisfaction. Improving business process performance; gain agility, create value, and achieve success. Raynus, who is associated with an information technology process performance management consulting company, outlines an eight-step holistic process to help managers solve management issues and work on strategic, tactical, and operational levels. The approach is structured around the process value delivery rather than functions and focuses on up-front planning using already developed methodologies to translate dynamic strategy into action. It involves value creation, management, and sustainment, and aims to alert management to problems and opportunities and use quantitative information and company-wide collaboration in business strategy.